CORNING, NY – A soapstone sculpture by Inuit artist, Abraham Anghik Ruben, was recently acquired by The Rockwell Museum and installed today in the permanent collection galleries of The Rockwell. 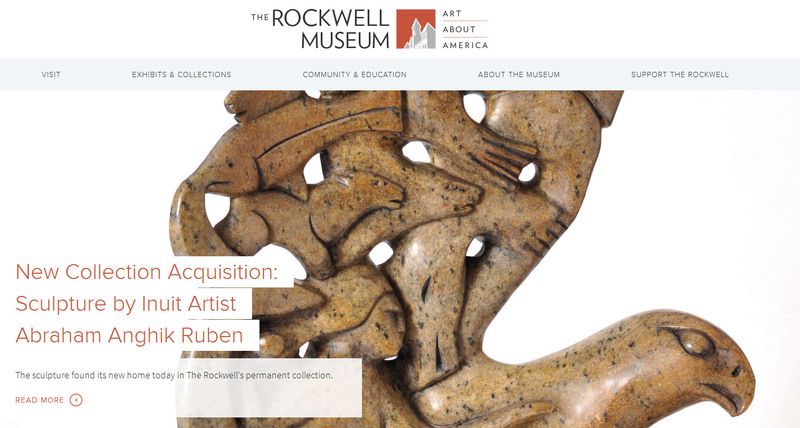 The recent acquisition, entitled Birds, Animals, and Spirits, is a one-of-a-kind sculpture created specifically for The Rockwell Museum collection by Ruben. The work of Ruben is not new to Rockwell audiences. Some 20 soapstone and bronze sculptures by Ruben were featured in a temporary exhibition at The Rockwell during the summer of 2014. Having the work of world-renowned artist Abraham Ruben on display at The Rockwell places the museum among good company. Ruben’s sculptures have also been on display in such prestigious American art museums including the Smithsonian, National Museum of the American Indian and the De Young Museum in San Francisco. Ruben’s soapstone carving is now on display in the third floor permanent collection galleries at The Rockwell, encased in a 360 degree glass unit for visitors to explore the intricacies of his integrated three-dimensional design. The artist is well-known for the fluidity of his carving, for his merging of Inuit and Norse traditions, and for the strong narrative quality inherent in his work. 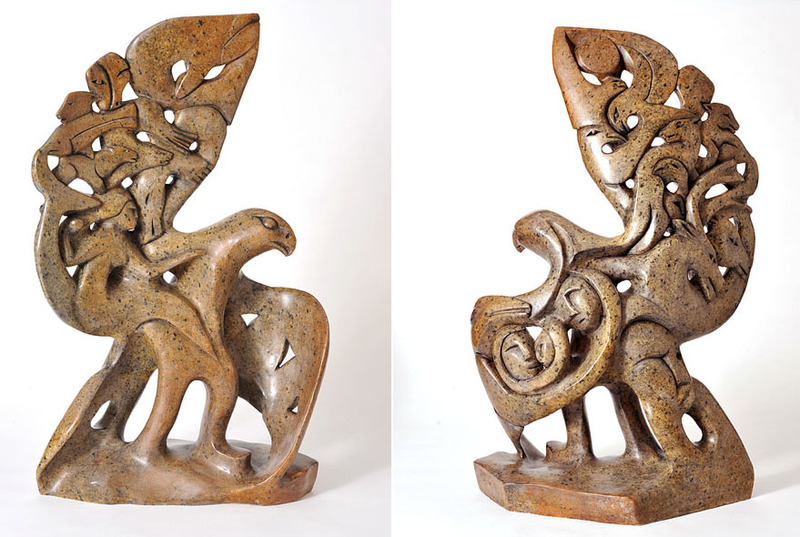 This soapstone carving depicts an Inuit shaman metamorphosing into a falcon through the transformative power of ceremonial dance. Shamanism is a religion which was widely practiced by the native tribes of North America in which the practitioner, or shaman, enters into a trance-like state in order to communicate with non-human spirits. Shamans served as intermediaries between the earthly and spiritual world, seeking guidance and intervention on behalf of their communities for healing, favorable weather, successful hunting, and victory in battle. The left wing of the falcon depicts the Sedna, a female Inuit deity believed to have created and to have control over the creatures of the sea. Above her the artist has rendered the seals, walrus, whales, and fish of her domain. This visual passage reveals the purpose of the shaman’s dance: an invocation of Sedna to bless the tribe with favorable hunting and fishing. In the traditional Inuit culture – which relied so heavily on the sea for its existence – it is no surprise that the marine deity Sedna figures so prominently in their art. The reverse of this sculpture depicts a raven embracing a family within its wings. Unlike other northern birds, ravens are constant inhabitants of the artic throughout the year. Raven is also a specific cultural hero and trickster within Inuit tradition. The Inuit creation story tells that curious Raven pried open a clam shell to discover the first humans, coaxing them out into the world between the sea and earth. The Rockwell Museum, its board of trustees, and supporting patrons would like to recognize the graciousness and generosity of the artist in presenting our institution with such an important work of contemporary Inuit art. The Rockwell Museum collection tells the story of the American experience through a display of stunning art about America. Founded in 1976, The Rockwell is an evolving community center which showcases the best of America through compelling exhibitions and imaginative programs. The diverse collection includes a mix of contemporary Native American art with traditional bronze sculptures, landscape paintings and other works that embody America. Housed in the beautifully restored 19th century Old City Hall building, The Rockwell is active in the local community and holds special events and educational programming with area public schools. The Rockwell provokes curiosity, engagement and reflection about art and the American experience.